Warm apple spiced gluten-free cinnamon rolls stuffed with caramelized cinnamon apples, pecans with a salted caramel glaze. A perfect fall breakfast treat. Every year whenever September rolls around, I get excited to step back into the kitchen to use the stove and oven more often again after enjoying a few months of summer grilling and no-bake treats. As much as I will miss all the sweet summer berries, endless sunshine and carefree days that summer brings – I adore fall. It is my favorite season for baking with all the warm spices of cinnamon and nutmeg along with apples and pumpkin. Cinnamon rolls hold a special place in my heart. I can’t think of anything better than the sweet intoxicating aroma that fills up the house while a pan of warm and sweetly spiced rolls are baking in the oven. I don’t make them as often as I would like since they do require some planning but it’s always completely worth it in the end. If you’re a fan of apple pie and cinnamon rolls then you are going to fall in love with these! They are seriously the best of both worlds. Lately, I’ve been trying to come up with a gluten-free dough recipe that still produces great tasting rolls. Although they may not replace the Cinnabon ones, they were a hit when I brought them over to a friend’s party. The entire pan was gone by the end and nobody could tell that they were gluten free. I am still on a quest to come up with a recipe that doesn’t require buying a special gluten free flour blend (it is a mixture of whole grain brown rice, white rice flour, tapioca, corn starch, and xanthan gum) because various brands may yield different results — but until then, this will be the recipe I will be using for now whenever we need a gluten free cinnamon roll. The dough is soft and sweetly spiced while the center is bursting with caramelized cinnamon spiced apples that just melt in your mouth! A sprinkling of chopped pecans adds a nice crunch where you roll it all up, slice, set aside to rise again, and bake. While they bake, you whip up the most amazing salted caramel glaze to slather on top once the rolls are warm from the oven. Throw on another spoonful of that caramelized apple filling and you have extraordinary cinnamon rolls that are a perfect welcome for fall. In a medium saucepan, combine milk, vegetable oil and sugar over medium heat until the mixture is warm and frothy but do not allow to boil. Pour mixture into large mixing bowl and allow to cool to lukewarm. Sprinkle yeast on top of the lukewarm mixture and allow to sit for 1 minute. Add 4 cups of the flour and mix until just combined. Cover with a damp towel or plastic wrap and let rise for 1-2 hours or until doubled in size in a warm and draft-free environment. In a small bowl, combine the cinnamon and sugar together. In a medium saucepan on medium heat, add butter and brown sugar until caramelized, toss in diced apple chunks. Add lemon juice, cinnamon, cloves, ginger and nutmeg, salt and stir together allowing to come to a boil. Reduce heat to a simmer until apples have reached desired tenderness. Remove from heat and stir in vanilla extract and allow to cool. Place a large piece of plastic wrap on the counter and flour the plastic wrap as well as your rolling pin. Place another plastic wrap on top of the dough. Place the rolling pin on top of the plastic wrap and roll doll out evenly but not too thin (about 1/2 - 3/4 inch thickness) into a rectangle about 16 x 10 inches. Add more flour as needed if the dough is too sticky. Remove the plastic wrap on top. Brush the softened butter evenly on top. Sprinkle cinnamon sugar over the dough leaving a 1/2 inch border on all sides. Spread the apple pie filling evenly over the dough and top with chopped pecans. Sprinkle with more cinnamon/sugar if desired. Place rolls in a lightly greased 9-inch round pan. I used a cast iron skillet, lightly sprayed with nonstick spray. Cover the rolls loosely with foil and allow to rise in a warm, draft-free place for another 30 minutes. Preheat the oven to 375F. Bake for about 19-25 minutes or until lightly browned. To avoid heavy browning, cover rolls with foil after 12 minutes of baking. Remove from oven and glaze. Store in an airtight container and reheat in microwave if desired. In a medium saucepan, add butter on medium heat until melted. Stir in brown sugar, salt, and heavy cream whisking constantly until sugar is dissolved and boiling for a minute. Remove from heat and whisk in vanilla extract. Continue to whisk in powdered sugar a 1/4 cup at a time until desired consistency is reached. Pour over cinnamon rolls and top with more chopped pecans and reserved apple filling. Rolls are best enjoyed on the same day. Dough can be made the day before before filling them after step 3. **If gluten is not a concern, feel free to use all purpose flour instead or your favorite cinnamon roll recipe. Oh dear “Apple Pie Pecan Cinnamon Rolls with Salted Caramel Glaze ” I could eat the whole pan -without sharing! These sound terribly addicting!!! the glaze, the pecans, the apples….oh dear!!! Added kudos since they are GF – I need to check out that gluten free flour blend…that dough of yours looks incredible! Hehe thanks so much sweet lady 🙂 Hope you’re having a great weekend so far! Apple pie and cinnamon rolls in one??? Amazing!!!! I’ll take the whole batch! They look so good Kelly! Wow these cinnamon rolls are stuffed with great flavors! I can’t wait to go apple picking and make some apple treats too! Can I come over for breakfast? 🙂 These apple pie pecan cinnamon rolls are making me drool right now, and I just had breakfast! Haha, you and Addie are ALWAYS welcome here for breakfast any day – it would definitely help so I’m not tempted to polish the entire batch off my self 🙂 Thanks Eva and hope you’re having a great weekend so far! Thanks Lisa 🙂 Haha yup, pumpkin everything already – can’t believe how fast fall is sneaking up on us 🙂 Yum, chili and cornbread sounds perfect – hope you are having a wonderful weekend so far! Kelly, these rolls look absolutely DREAMY! Seriously, your pictures are outta-this-world stunning and I want to grab some of that caramely apple goodness straight outta my screen. And apple pie in a cinnamon roll? I don’t think anything could beat that. 🙂 Pinned! Haha thanks so much girl :). Your pics area always leaving me drooling so I’m so glad you like these. Thanks so much for pinning too and hope you’re having a great weekend so far! These cinnamon rolls look so amazing, Kelly! What a perfect way to ring in the fall! I’m so loving that you added apples and caramel in these cuties. Pinned! Good grief, these can be ‘dangerous’! I never much liked cinnamon rolls but ever since I had an odd craving for them and made some, my husband and I keep wanting more! I made another small batch about 2 weeks ago…I’m almost glad it takes some planning or I might end up enjoying them constantly. I’m so intrigued that gluten free can taste “normal” these days. I don’t have much of any experience in that regard but I’m glad more and more products and good recipes are available to those who need it. Your rolls look so luscious. I can imagine it was devoured by all and brought a moment of bliss for everyone! Thanks so much for stopping by and pinning Ashley 🙂 Hope you enjoy the rest of the weekend! Eeks hope you get cooler weather soon Shundara 🙂 Thank you and hope you are having a great weekend so far! Yum! I love pecans and I love fall recipes! I could never get sick of apples + pumpkin + spices. o Kelly, my mouth is watering…these cinnamon buns look amazing! Thanks so much Olivia, hope you are having a great weekend so far! These rolls look extra deluxe in the delicious area! I just want to sink my teeth into a couple of these! Need these in my life! Cinnamon rolls hold a very special place in my heart too. . along with donuts and sticky buns. I knew I liked you. 😛 And Fall is my favorite season for baking too! LOVE these apple pecan cinnamon rolls. . they look soooooo good! can’t wait to get started baking with apples! Haha oh my gosh heck yes to donuts and sticky buns too 😀 Yay for fall baking and I can’t wait to see your apple recipes, I know they will be totally drool worthy 🙂 Thanks Alice and hope you’re having a great weekend so far! Aaw thanks so much Arpita 🙂 You rock too girl! Thanks Aimee 🙂 Hope you’re enjoying the weekend so far! Cinnamon rolls really are the best, total comfort food! I love this variation, definitely perfect for fall! Thanks Danielle – cinnamon rolls and sweet potatoes are total comfort food to me 🙂 Hope you’re having a great weekend so far! As much as I love summer produce and grilling, fall is my favorite, and I can’t wait to dive into the season! These cinnamon rolls look amazing, and the perfect way to kick off fall! And of course, you gotta have the salted caramel sauce — delicious touch! Thanks Marcie. I’m ready for fall now too 🙂 I will just miss all the yummy summer fruits and veggies since they were so good this year. Haha – yup, gotta love that salted caramel sauce – thanks Marcie and hope you are having a great weekend so far! okay, so my mouth is watering… cinnamon apples and carmel = amazing! Thanks Kristina 🙂 Hope you’re having a great weekend so far! The mention of cinnamon and caramel have me drooling. Not a big fan of cooked fruits, but these look AWESOME! Thanks so much Jacquee 🙂 Hope you’re having a great weekend so far! I don’t think these would make it out of my house. They look so amazing and I love the apples. Hehe thanks so much Cindy 🙂 Hope you’re enjoying the weekend so far! You and these rolls hold a very special place in my heart!! 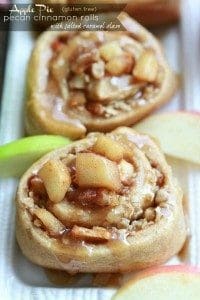 I was going to make cinnamon rolls this weekend but now why make boring rolls when you can stuff them with apples? Amazing!! Aaw, you know I definitely feel the same here my dear:) Haha aaw thanks, you totally should still make some (yum – maybe pumpkin ones?) so I can drool over them too! :) Hope you have a great rest of the weekend Z! Thanks so much Medeja – wish I could send yousome 🙂 Hope you had a wonderful weekend! Oh hooray, it’s going to be apple season soon! These rolls look absolutely lovely! I can’t believe they are gluten free! I totally freaked out when I saw this pic on Instagram!! I have a hugeee weakness for apples and cinnamon! Kelly these are AMAZING! I am a huge fan of cinnamon rolls (which I never make), so to see them all made up, and how gorgeous and mouth watering they are ~ it makes me want to reach right into my screen and grab some. The caramelized apple filling looks so decadent and rich. Just like a cinnamon roll should be. Pinning! Aaaw, thanks so much sweetie – so glad you like them. Thanks so much for pinning too! Hope you had a great weekend! WOW Kelly! This is amazing! GF rolls are no joke without egg! Amazing job and of course gorgeous photography! Pinned and shared! Aaw thanks so much girlie, so glad you like them 🙂 I tested out so many and even though it won’t beat my husband’s favorite Cinnabon, he says these were his second favorite which I’ll take haha 🙂 Hope you had a great weekend and thanks so much for sharing and pinning too! Wow Kelly these look seriously mouthwatering! I love apple pie, it’s one of my favourites, but combined in cinnamon rolls, that’s awesome. I always think cinnamon roll filling is a bit dry but you’ve totally solved that problem. And that caramel topping…..YUM. Oh my gosh Kelly!! Sent me one (or a few!) of these please! haha They look amazingggg. Cinnamon rolls combined with apple pie?? Genius! the runny and sticky salted caramel really get me! The fact that I’m laying in bed on the web and seeing this right now just isn’t fair! My sweet tooth has kicked into full effect and its late. Filing under “will make tmrw!” Looks fantastic. WAAANNNT!! Especially for breakfast. Yum. These sound so warm and inviting – perfect for this time of year! Kelly, I am loving how you made these… love the gluten free action! I’m sharing this on FB and pinning this delicious recipe! I love everything about this! The perfect combination of flavours. I am going to be all over this at Christmas. Kelly, can you pretty please send me some leftovers (not that you probably had any left, these are so gorgeous)! I bet your house smelled amazing after baking these! I didn’t realize it until you shared these that my no-back series has totally been a seasonal summery thing. I’m so excited to get baking again, too! I looove these fall flavors so much, Kelly! Can’t wait to turn the oven on! WOW Kelly, these look out of this world amazing. Pinned!!! WOW! Best cinnamon rolls EVER! This is one genius recipe girl!! Brilliant and I can have 2-3 for breakfast with black coffee!! Oh dear! I can’t believe those are gluten free! They look fabulous! Cinnamon rolls with apple pie filling and salted caramel sound absolutely perfect to me! Pinned! Oh wow. It’s official. I’m not doing anything this weekend but staying in and baking fall-flavored treats. These are at the TOP of the list! You combined two very wonderful treats!! These look fabulous. I could certainly dive into one right now! Wow! Those look absolutely amazing! Can’t wait to share them with my followers. 🙂 Came over from Saturday Night Fever on Laura’s blog.